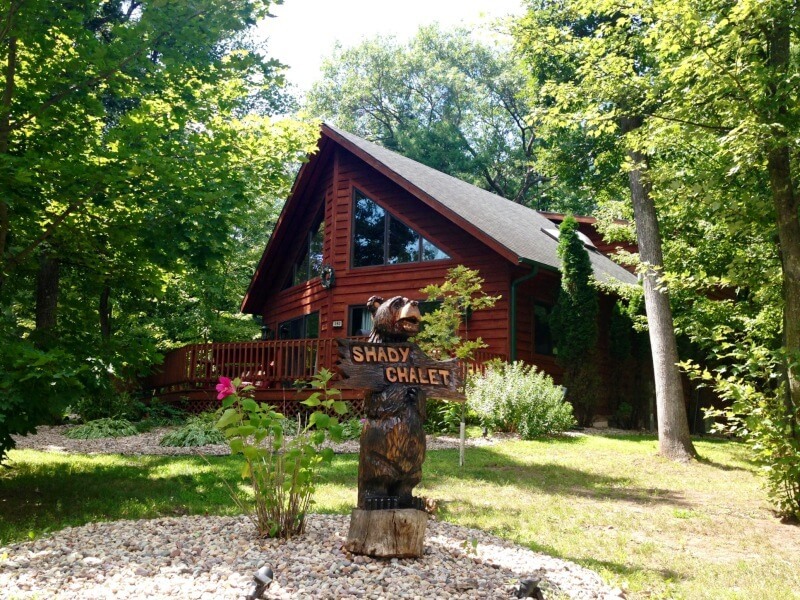 Conveniently located with quick access to everything Wisconsin Dells, this grand three bedroom home is the ideal getaway for family or friends. The Shady Chalet consists of two levels plus a beautifully finished basement. For outdoor entertainment, it has two sliding doors that lead out to a full wrap around deck complete with charcoal grill and seating area. Between the spacious deck and the custom furnished fire pit this home is the hot spot for entertaining outdoors year round. It sleeps a maximum of 8 people. Upon entry, vaulted knotty pine ceilings welcome guests to the great room on the main level. 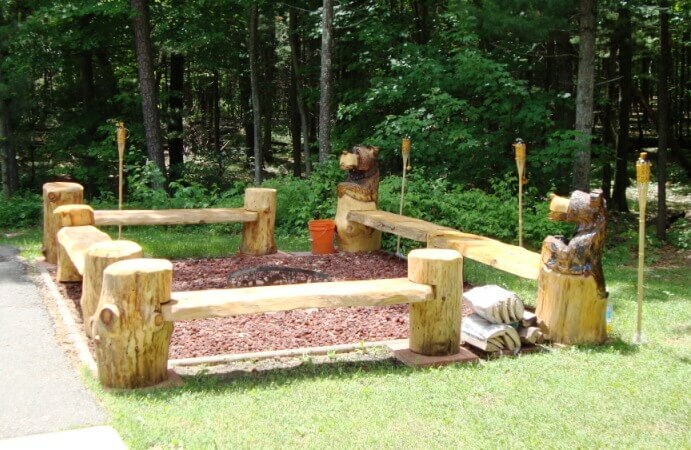 The dining area has a custom log table with seating for twelve and a stone breakfast nook which seats four. The user friendly kitchen comes equipped with full size appliances including a dishwasher. The common area houses the first (half) bath. Guests may choose to lounge the weekend away in the spacious living room which is adequately equipped with a stone wall gas fire place and a TV. The roomy master suite is also located on the main level. Featuring a king-sized, custom made log bed, a large walk in closet and flat screen TV this room provides ample space and privacy. The master bathroom comes with a jetted tub, full length double sink and walk-in shower for additional convenience. The second floor offers two bedrooms with TVs– the first with a queen and the second with two queen beds – each with a view of Wisconsin’s scenic woods. Upstairs guests also have access to a shared full bathroom. The adjacent loft area offers additional seating and a skylight for star gazing. The finished lower level is home to the game room complete with air hockey, foosball, shuffleboard and pool tables. It also offers a wet bar with mini fridge and microwave, a fourth (half) bathroom and a second dryer. Bring a friend, pack the playing cards and leave the devices at home; this home does not provide internet access. And guests still might not leave the game room! The Shady Chalet is conveniently located near an outdoor pool and is just a short drive to Spring Brook’s Clubhouse, which is home to the Spring Brook Sports Bar & Grill, indoor/outdoor pools, fitness room, golf course and pro shop. Home sleeps maximum of 8, rates based on 6 people over the age of 3. Extra guest fee of $15/night per additional guest applies. Security Deposit of $500 required.